Investment bank Goldman Sachs has released its latest research note on the current state of the oil market, with price projections and an assessment of four possible paths forward as the oil market seeks to rebalance. Here are some of the top observations from the report. Year to date approximately $10 billion of equity has been injected into high-yield E&Ps, and $26 billion has been injected into investment grade producers. Even though shale producers are hurting, the amount of financial stress that the sector is experiencing is “not critical,” and money continues to flow to distressed drillers. Why? Because even though investors are losing money on shale producers at the moment, everyone still expects the sector to rebound in 2017. In Goldman’s words, “consensus forecasts, ours included, continue to call for higher prices and sequential shale production growth by 2017, creating the perception of a good entry point even at today’s elevated equity valuation levels.” Year to date approximately $10 billion of equity has been injected into high-yield E&Ps (producers that are now ranked as too risky to be classified as investment grade), and $26 billion has been injected into investment grade producers. Continued access to capital for oil producing companies means that prices need to continue to stay low to wash out more U.S. production. Since December, 13 percent of U.S. E&Ps were downgraded from Investment Grade to High Yield. Fifty-six percent of production is still coming from Investment Grade producers. A possible worst-case scenario for market rebalancing could come in the form of overwhelming storage capacity in either crude oil or products (gasoline and diesel), which Goldman sees as a legitimate possibility. 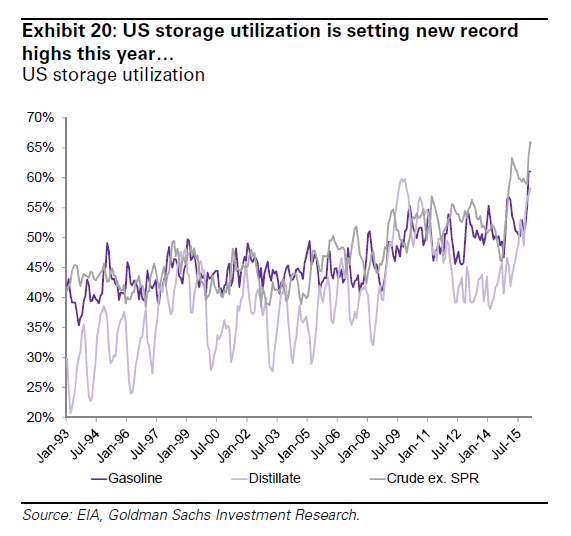 Goldman highlights that the recent uptick in crude oil prices has come in spite of continued builds in storage, and the fact that U.S. storage utilization rates are reaching record highs. This mismatch between inventory levels and prices is either because traders think that EIA is underestimating U.S. storage capacity, or traders see significant room in offshore storage. Goldman emphasizes that offshore storage is a limited solution, because of limited loading capacity, limited Jones Act vessel availability, and the requirement that crude oil stored on foreign vessels is offloaded at the same port as loading. According to Goldman, the potential to reach storage saturation in diesel and gasoline is critical, because it would force a major slowdown in refinery processing of crude oil. 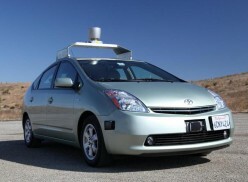 This could result in crude storage capacity being overwhelmed. Goldman sees crude oil inventories continuing to build through April, before seasonal draws begin, but adds that higher refinery utilization in the meantime could still cause major stress for storage capacity (margins are currently strong, which incentivizes high throughput), and the risks of storage constraints and bottlenecks remains elevated. Goldman says this will force production cuts based on what’s been observed in the past. Goldman doesn’t see an OPEC cut as likely. The “Freeze,” whether it materializes or not, doesn’t have a significant bearing on its production forecast since the group’s analysis expected Iraq’s and Russia’s production growth to stall in Q1, and Saudi Arabia was not expected to increase output this year. 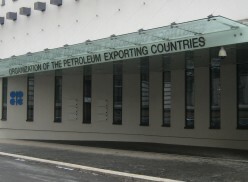 However, disruptions among OPEC producers have upticked, as an attack on the Ceyhan pipeline between Kurdistan and Turkey has shut in 550k b/d of Kurdish oil production (there is no backup storage or trucking capacity), and Shell has declared Force Majeure on the Forcados oil export terminal in Nigeria, taking some 200k b/d offline. 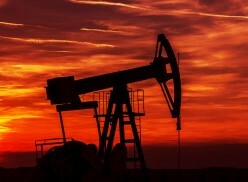 However, some OPEC production is likely to be price sensitive this year. For example, in southern Iraq, production is likely to decline steadily because the government has asked the oil majors to scale back this year, while higher oil prices could lead to some production growth in a few OPEC countries. Similar to shale, that price trigger is around $50 per barrel. Goldman cautions on a very large backlog of drilled but uncompleted wells, which could represent up to 620k b/d of production for six months. Because shale producers still have access to capital, the current boost in crude oil prices could materialize into a “self-defeating rally,” much like we saw in spring 2015 when oil prices bounced off lows around $40 per barrel back into the $60 range. The current movement in prices has further potential to bring back shale oil output, “reversing nascent supply curtailments” and preventing the market from properly rebalancing. Additionally, Goldman cautions on a very large backlog of drilled but uncompleted wells, which could represent up to 620k b/d of production for six months. Significant additional capacity in the oilfield service sector will also help in allowing for a rapid ramp-up in production if prices hike above $45 per barrel. At the moment, futures markets are polarized and bloated: WTI short speculative positions at near record levels, while Brent long speculative positions are at record highs. Goldman says the current trading range between $20 to $40 will persist through Q1 2016 (which is basically over), and then stay in the $25 to $45 range through Q2. Prices should rise to $55-$60 per barrel in 2017, which will coincide with the need for a boost in U.S. shale production. Overall, it will remain a supply-driven bear market during the next two years.